Assuring that kids get ample exercise is easy when the weather beckons them outside to play but once there is a chill in the air many kids tend to stay inside, parking themselves in front of the television or computer screen. Fitness needs don't take a break when the temperature drops, though, so parents need to find ways to keep their kids active all year round. Fortunately, there are plenty of fun things to do, even when it isn't warm and sunny. For kids fortunate enough to get a snowy season, winter can easily become their favorite season. Skiing, both downhill and cross-country, provide excellent fitness benefits. With their newer design, alpine (downhill) skis are easier to maneuver than those of the past. Shorter and lighter, today's skis are perfect in helping even beginners handle the slopes like champions. Cross-country skiing is fabulous for both aerobic training and muscle development, as is snow-shoeing. Kids who enjoy nature walks in warmer weather are likely to enjoy donning a pair of snowshoes and hitting the trails. For more adventurous types, snowboarding may be the ticket. Finally, ice skating, sledding and snowman building not only provide great workouts, but are terrific for family fun! Just like hot weather, being outdoors in cold temperatures comes with certain cautions. Kids need to be properly protected from the elements, but when equipped with the right gear, they can enjoy all season outdoor play. Sunscreen (and lip balm with sun protection) is a must for all exposed parts. Bright winter sunshine (and the reflective quality of snow) can cause just as much skin damage as summer sunburns. Good quality sunglasses or goggles are recommended, too.Hats help to retain body heat and mittens or gloves will keep little fingers from getting too cold. Boots should be toasty warm and waterproof. 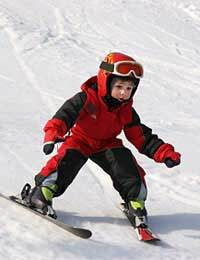 Kids may want to wear several light layers of clothing rather than one bulky jacket so that they can add or remove layers as necessary, remaining comfortable throughout their playtime.Specialty snowboard pants provide extra padding on the knees and seat for more cushioned falls! Helmets, knee and elbow pads, face masks, and other gear are recommended for all ice hockey players, and beginner skaters may want to consider some protective gear, too!All sporting equipment, such as skis, snowboards, ice skates, and snowshoes must be in good condition. Check before each usage. Finally, kids should be made aware of the dangers involved in building snow buildings or forts. They can easily collapse, trapping children beneath a heavy layer of snow. Young kids shouldn't play in the snow alone and older kids and teens need to be sure that someone knows where they will be in case they need assistance. While it's best to get outside in the fresh air every day, there are times when the weather is simply too foul for outdoor activities. Parents can still make sure that their kids get sufficient exercise by organising a family dance party or an evening of charades or "Twister." Other good options are exercise videos, dance videos, or active video games such as Dance, Dance Revolution. The important thing is that kids get up and move their bodies, walking, running, jumping, and climbing each and every day. Sunlight is a natural mood enhancer, as is exercise. When kids (and the rest of us) workout, their bodies release "feel good" chemicals called endorphins. When endorphin levels drop, cravings for high fat foods can develop and kids soon learn that they temporarily feel better after indulging in a fatty snack. Fortunately, mood enhancing endorphins increase upon exertion, too, which is a far better choice than eating an order of fried potatoes! Studies show that rigorous workouts have the ability to improve mood, decrease symptoms of depression and anxiety, and increase body confidence. Taking all of that into consideration, its seems obvious that heading out for a winter workout is a great idea!